Picture this: your typical night with a lot of movement as you sleep. Sometimes you might even jerk and wake up because there are a couple of dust mites driving you up the wall. Even worse is that person who gets so warm or the poor allergic child who wakes up with a pesky rash on the neck and cheek area. Have you ever considered substituting your old cotton cooling pillow for a bamboo pillow? It might just be the thing you need. Let me tell you why. The best bamboo pillow packs a few advantages over your regular pillows. 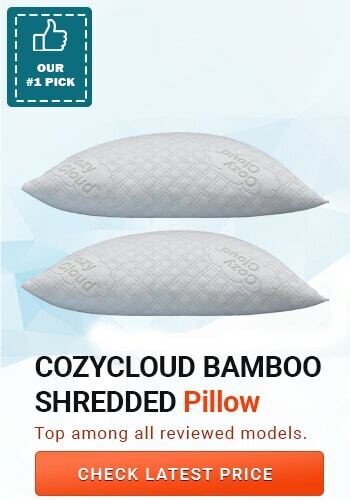 Another stunner from the American company, CozyCloud, this bamboo pillow comes with a lot of technology to make your sleep a lot better. The pillows are available in two sizes; Queen and King. As with all memory foams, there is always a tinge of the plastic odor or off-gas that comes with the product. You should give it a few hours in an open space for the smell to fade off. 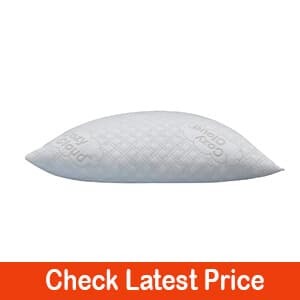 This product is a memory foam pillow made using a unique blend of Lycra, polyester, and viscose from bamboo. The combination makes their bamboo pillows unique. Additionally, the pillow has special memory foam that the company claims will never lose shape or flatten out. Each package gets nicely rolled, and vacuum sealed to make for easier shipping. Did we mention that you have a 90-day no hassle guarantee plus a 20-year warranty? Some users found the memory to be a little too firm. But the 90-day guarantee is plenty of time for you to break into it. There is a slight off-gas when you take the product out of its package. Please give it up to 48 hours to expand and lose most of that smell. 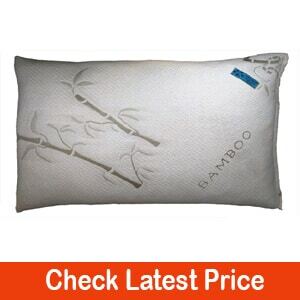 This bamboo pillow is extremely breathable and has a comfortable feel. It also features a cover made from a blend of viscose rayon (40%) and polyester (60%). The memory foam patented by this American company is adaptable to all sleeping positions. The pillow itself is CertiPUR-US Certified and hypoallergenic. The proprietary shredded foam is particularly ideal for side sleepers because it is quite firm. People with back pain will also find this pillow to help reduce pains because it helps align the spine in a normal position. This pillow is also ready to be thrown in the washing machine at any time. There might be an odor when you unpack the pillow. Please allow up to 48 hours for the smell to fade away. What is interesting about this pillow is that aside from the King size pillow, it also comes as Queen, Standard, and even Toddler or Travel. It can, therefore, be a suitable purchase for those who want to take the pleasures of bamboo pillows out on the road. The pillows have shredded memory foam that is 100% CertiPUR-US certified. What you also get is the cover made from a blend of bamboo (40%) and polyester (60%). These covers will help wick any excess sweatiness during the night. The pillow can be thrown whole into the washing machine. However, you should wash cold and dry cool or even put it in the open. The company has a 30 day ‘no questions asked’ return policy. This bonus comes on top of the 5-year limited warranty. This next pillow is an exceptional take on pillows. The company chose made a full body pillow to give you maximum support for the whole body. The outer cover consists of three individual layers woven together. The result is a breathable rayon derived fabric that works to regulate your body temperature. Also, note that all pillows are vacuum sealed to help make transportation easier. The company has a lifetime warranty with each pillow set it sells. The available sizes are Full-Body, Queen 2-pack, Queen, King 2-pack and King. Should you not be pleased by the quality or any other aspect, they have open doors for a 30-days money back guarantee. So why should you consider getting a bamboo pillow? The key advantage is that bamboo pillows are hypoallergenic. The fibers of bamboo do not contain any chemicals and therefore are natural and very gentle on the skin. You can grab one of these for your kids with skin complications or even for yourself. Comfort is king. And for bamboo pillows, this could not be further from the truth. Right from holding them, you will agree with me that they are incredibly tender and flowy. Bamboo pillows come with a neutral odor that makes it inviting to anyone to sleeping on them. Another selling point is that bamboo fibers contain anti-bacterial properties. Any tiny pests like dust mites or smaller germs that might put your health at risk get naturally repelled from bamboo pillows. Bamboo pillows are very breathable, and this is their biggest advantage above other regular pillows. They regulate temperatures during the night. The result is that you will have the assurance of peaceful nights. Finally, bamboo pillows are sustainable products. Bamboo does not rely on extensive resources to grow and maintain. In fact, it matures faster than most other fibrous plants like cotton and sisal. You will be saving the planet a few extra resources if you purchase a bamboo pillow. To find the best bamboo pillow for your current lifestyle, please consider the following tips. Bamboo pillows usually come in many different designs and sizes. The quality also differs from one product to another. When choosing, you want a pillow size that is suitable for your sleeping needs. Back and side sleepers should use medium and small sized pillows while stomach sleepers should opt for wider pillows. 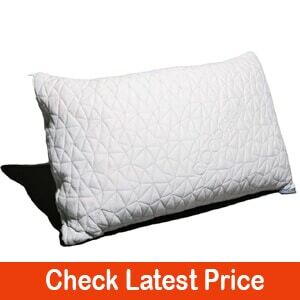 The quality of your pillow covers is something you should also consider. They can either be 100% rayon or viscose from bamboo or a blend of Lycra or polyester. For pillows made from 100% bamboo, they will be very soft but will require a lot of care in maintaining. Their quality is high and so it the price tag. 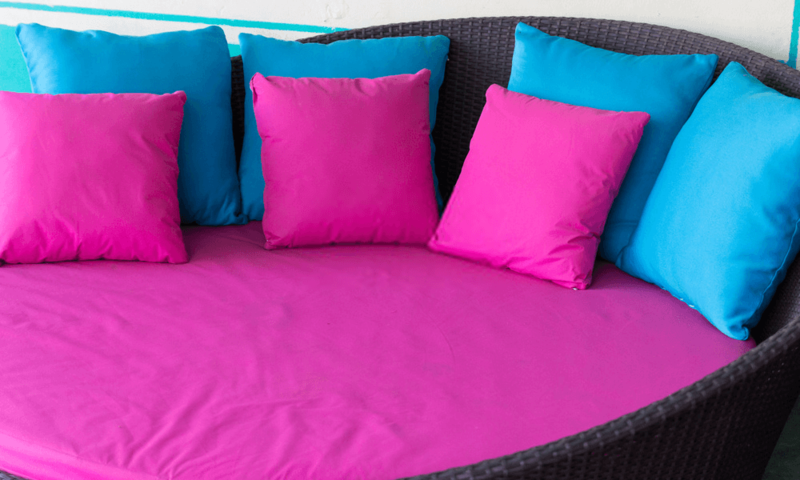 Those pillows that are a blend are usually more affordable and easier to maintain. Bamboo pillows will also have certifications like CertiPUR-US which shows that it was made using safe chemicals. You can also find those that are recommended by health professionals because they have been proven to work well. 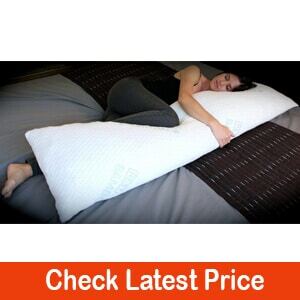 There are so many brands of pillows on the internet that the quality differs a lot. We recommend that you buy from a store or website that has a large variety. Some stores will allow you to try different sizes and qualities to find whichever is best for you. You should also read the customer feedback about those products before you buy them. Using sites like Amazon, you will be able to get the real opinion from verified clients. You will also see the ratings on different pillows. You can check reviewer website, and videos online to help you decide. After receiving the packaging of your pillow, please don’t use any sharp objects to open. You might cut the pillow itself. The pillow might be a little deformed after unboxing. Please leave it for up to 48 hours in an area with plenty of air for it to gain shape and lose any odors it might have. Don’t worry if the pillow feels a little weird at first. After a couple of weeks of usage, it should have fully adjusted and will be comfortable. On many products, the cover is removable and can get washed in a washing machine. Ensure you carefully follow the washing instructions because bamboo is delicate and might shrink if you wash on high heat. You might also realize that bamboo products will have very specific instructions on how to wash for the first time. When it comes to drying, you can either tumble dry on the lowest heat setting or just air it outside. You should wash the pillow itself by hand. Dry it in the open air until thoroughly dry. We have a video from essortment (on YouTube) that explains on how to clean the memory foam of your pillows. We have already made you a selection of the best bamboo pillows for this year. It is never too late to change your resolutions and add a couple of bamboo pillows on the list. Our top pick for this review has to be the Snuggle-Pedic Bamboo Combination Memory Foam Pillow With Kool-Flow Micro-Vented Cover. The reason for this selection is because of the blend of viscose, polyester, and Lycra. You can expect absolute softness while keeping the pillow breathable. The other big plus is the competitive price point. Also, the company gives you each pillow with a 90-day hassle free refund and a 20-year warranty. Talk about great value! As with many memory foam bamboo pillows, it is common to find that chemical smell immediately after unboxing. Be sure to leave the pillow in an open area for a few hours to allow the smell to go away. Otherwise, I hope you now have a better picture about which can be the best bamboo pillow for you. 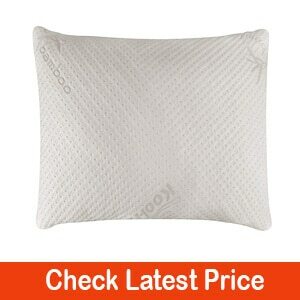 Please drop us any updates or comments about the bamboo pillows you have used or want to buy. See you next time!